TULF Leader Amirthalingam Assassination in 1989: President Premadasa’s UNP Govt Shields LTTE From Blame. An official delegation representing the Liberation Tigers of Tamil Eelam(LTTE) was engaged in negotiations with the Government of President Ranasinghe Premadasa in Colombo when Former Leader of the opposition Appapillai Amirthalingam and his colleague Vettivelu Yogeswaran were assassinated by a tiger hit squad on July 13th 1989.The assassination caused much embarrassment to the Premadasa regime which initially embarked upon a concerted campaign to absolve the LTTE of responsibility. It was indeed a time of great confusion and initially many were ready to grant the benefit of the doubt to the LTTE. However the passage of time saw the LTTE itself admitting to the killing openly thus exposing the pathetic cover up attempts of the Govt which had “muttai/bithara” all over its face as a result. 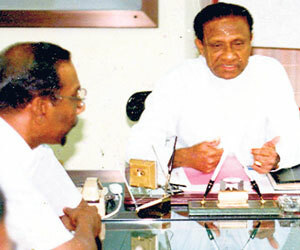 The LTTE negotiating team was led jointly by its chief political strategist and adviser Anton Stanislaus Balasingham alias Bala annai and political wing head Naren Yogaratnam alias Yogi.The tiger negotiators had paid several visits to Colombo for talks with President Premadasa himself , his senior cabinet ministers and top bureaucrats. Most of the talks were held at the “Sucharitha”residence of President PremadasaThe LTTE team had been housed at the Hilton Hotel during the early days. Subsequently they were accommodated at the Galadari Meridian hotel.The Police Special Task Force(STF) was in charge of security for the LTTE during their Colombo sojourn. As stated in these columns earlier Amirthalingam and Murugesu Sivasithamparam were scheduled to attend a dinner hosted by Indian High Commissioner Lekhan Lal Mehrortra in honour of visiting Indian special envoy VG Deshmukh at Taj Samudra hotel on the night they were gunned down at 342/2 Bauddhaloka Mawatte along with ex-Jaffna MP Yogeswaran. Sivasithamparam was the Tamil United Liberation Front President while Amirthalingam was the TULF secretary-general.While Amirthalingam and Yogeswaran succumbed to injuries the seriously injured Sivasithamparam survived. When the LTTE’s Aloysius telephoned Yogeswaran changing the time of meeting with the TULF, the tiger assassin had told the TULF ex-parliamentarian that Political wing head Yogi was likely to attend the talks. But ultimately it was Visu not Yogi who came,killed and was killed.Since the security officers at the TULF residence had been informed by Yogeswaran that Yogi was expected and also because of the strong resemblance between Yogi and Visu (both be-spectacled) it was surmised initially that Yogi had been involved in the assassination. This was how news of the killing was told to Indian envoy Mehrotra , cabinet minister Ranjan Wijeratne and other distinguished guests at the dinner for BG Deshmukh in Taj Samudra.It was former secretary of Finance B.Paskaralingam who first broke the news of the killing.Paskaralingam upon arrival told Mehrotra and Ranjan Wijeratne that Amirthalingam had been shot dead.A shocked Mehrotra queried when it had happened and was told fifteen minutes ago.Foreign minister Ranjan Wijeratne who was also the state minister of defence asked who was responsible.Paskaralingam replied that it was not wholly clear and that one of the assassins shot dead by the Police was the LTTE’s Yogi. A visibly agitated Ranjan Wijeratne got up from his seat and went outside to telephone his defence secretary Gen. Sepala Attygalle.He returned with a highly relieved look on his face and said loudly”No,no,it is not Yogi”. The LTTE had requested from the Govt that protection be provided by the STF and not the armed forces.A STF unit specialising in VIP security was assigned for the purpose. The officer in charge was Nimal Lewke who later went on to serve as STF commandant.DIG Lewke who is now retired from the Police was at the Galadari when news of the Amirthalingam killing reached him.He recounted what had happened then in an e-mail to me. “When it happened, I was at Galadari hotel, as I was in charge of security of the LTTE delegation led by Late Anton Balasingham, Yogi and others.STF was nominated as per the request of LTTE and it was a difficult task for us to carry out as we were fighting a bitter battle against them in the war front. Moment I heard of this incident, I immediately checked whether all the other LTTE delegation members were in the hotel. There were all there. Since they were all there, I told Anton Balasingham , what had happened. The impression that I got was that they were not disturbed at all,it was a blank look. I immediately visited the scene and saw the LTTE cadre who were shot by the security personnel and their bodies were inside the house where they were shot”. “Then came the other Senior Police Officers and they were discussing the incident and they were of the opinion that one of them (Vishu) who was wearing specs was Yogi, to tell you honestly he had a close look similar to Yogi, but, since I saw Yogi at the hotel I told the Senior Police Officers that it was not Yogi and that it was somebody else”. “As far as Amirthalingam’s killing is concerned what I told you is the only thing I can recollect because I went to the scene after everything was over. But on my return, I put many questions to Balasingham but he was very careful not to commit or to comment about Amirthalingam and it gave me the impression, they were not worried at all, as their movement has already identified Amirthalingam as an obstacle to their progress”. “One thing was very clear that all of them operated in different compartments and there were no connections to each other specially the intelligence ground operations were carried out according to the plan and others were not aware of it at all. Otherwise, they would not have carried out killings in the city at a time they were speaking to the Government which was a huge embarrassment to the President at that time”. As DIG Nimal Lewke observed the killing of Amirthalingam by the LTTE at a time when President Premadasa was talking to the tigers caused much embarrassment to the Govt. In a bid to divert blame the state controlled media tried to project an impression that the killing was done by some other elements who were trying to implicate the LTTE. The Govt controlled newspapers reported the incident as being committed by a “purported LTTE delegation”. Unnamed senior Police officials were quoted saying that inquiries were on to ascertain whether a third party responsible for the killings was falsely impersonating the LTTE. While the LTTE in Sri Lanka adopted silence the overseas tiger branch in London issued a statement denying responsibility.”The LTTE learnt with deep distress the tragic demise of the TULF leaders Amirthalingam and Yogeswaran.We suspect that diabolical forces are at work to discredit the organization and to disrupt the current peace talks between the LTTE and the Government of Sri Lanka”the London LTTE statement said. The inquest of the three assassins was held on July 21st. Apart from testimonies from security officials and relatives of the victims ,two other persons identified the three assassins. Apparently all three had been staying in an apartment at Andersons flats in Narahenpita. The trio had proceeded from there in the same cab to Bullers road on the fateful day.The persons who identified the dead trio by name were the chief occupant of the Anderson flat premises William Mariyadasan and Nadarajah Sathiananthan of Kassapa road in Colombo 5.Apparently Sathiyananthan had arranged for the trio to be housed at Anderson flats.They had earlier stayed with him.Both men were taken into custody. The three bodies were disposed of by the state after a reasonable period of time as no one came forward to claim them.The LTTE kept up its “denial”but there were reports of a mock funeral being held at Ananthapuram. The Tamil community grapevine however buzzed with the news that the tigers were indeed responsible. Moreover Indian officials had identified Visu clearly from their records and leaked information to sections of the Indian media.Aloysius and Sivakumar were relatively unknown to the Tamil public at large but Visu a senior leader was a known figure. Thus it became an open “secret”that Visu of the LTTE had killed Amirthalingam. 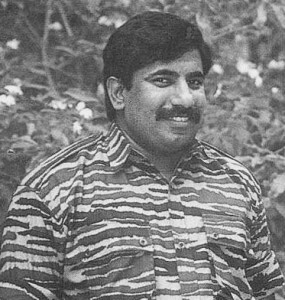 When this piece of information began spreading the LTTE was forced into revising their official denial.Since Visu was clearly identified as a senior leader of the LTTE, unnamed tiger sources began telling the media that Visu at the time of his death was not a member of the organization. The tigers had expelled him months ago on disciplinary grounds and so was not responsible for subsequent acts committed by Visu,it was said. The Premadasa regime too continued with its obfuscatory tactics.In August 1989 minister Ranjan Wijeratne held a press conference in which the then Inspector general of Police Ernest Perera also participated. The IGP told media that William Mariyasan had made a confession to Police that the LTTE as an organization was not responsible for the assassination and that the killers despite previous tiger links were acting on their own. Consequently Mariyadasan was indicted in the Panadura high court.The police submitted his confession which had been obtained under provisions of the Prevention of Terrorsm Act(PTA).Courts accepted the confession as evidence and convicted Mariyadasan sentencing him to seven years rigorous imprisonment. Mariyadasan appealed and in February 1995 the Court of appeal ruled the confession inadmissible and discharged him. It was proved in court that the confession purportedly made by Mariyadasan was actually not given by him. Meanwhile the Govt continued with its efforts to absolve the LTTE of blame in the Amirthalingam assassination.Former “Sunday Times”editor and “Indian Express”correspondent in Colombo, Rita Sebastian came out with a startling revelation at a press briefing held by Ranjan Wijeratne in October 1989.Rita said that she had seen portraits of Visu,Aloysius and Sivkumar at a tiger camp in Batticaloa among pictures displayed of fallen tigers. Rita asked Ranjan Wijeratne whether this meant the LTTE was responsible for the killing. According to Rita Sebastian, Minister Ranjan Wijeratne had pulled out his pipe,grinned mischievously and replied that he would check it out with Yogi of the LTTE.He never did! Even as the Government tried its best to keep blame away from the LTTE events began to overtake resulting in the LTTE officially admitting to the killing.This placed the Govt in an unenviable position. What happened then was this. With the LTTE disclaiming responsibility and disowning Visu as having been expelled, some of his family members were aggrieved and angry.Visu whose real name was Rasiah Aravintharam (I had mistakenly written it as Aravintharajah in my earlier article)was quite close to the then LTTE deputy leader Gopalasamy Mahendrarajah alias Mahathaya.At the time of his death Visu was actually heading the intelligence outfit set up by Mahathaya called “Beta -2”.It is believed that the assassination of Amirthalingam was planned and perpetrated by the Beta -2 under Visu as ordered by Mahathaya. Mahathaya and Visu were so close that several family members of Visu too were on familiar terms with the tiger deputy leader. Aravintharam alias Visu hailed from an upper middle class family in Vathiri in the Vadamaratchy sector of Jaffna. His father was a Registered medical practitioner. Visu’s elder sister is married to a medical doctor now residing in north America. An elder brother was a bank manager in Puttalam. Visu also had two younger brothers named Muhunth and Murali.The former is now in Germany and the latter in Britain.Visu studied at Nelliaddy Central College.He was an ardent supporter of the TULF in the 1977 elections and had daubed his blood on the forehead of ex-Jaffna MP Yogeswaran who was at one time the darling of Tamil youths. Visu was one of those involved in the July 5th 1987 LTTE attack on the army camp housed at his Alma mater Nelliaddy Central College. It was in this attack that Vallipuram Vasanthan alias “capt”Miller of the LTTE drove an explosive laden truck into the army camp and blew himself up thus becoming the first black tiger or suicide bomber of the LTTE.The LTTE started observing July 5th as “Karumpuli thinam”or black tiger day thereafter. When the July 5th operation commenced Visu was stationed on the upper floor of a house in the vicinity. He was in charge of a group tasked with firing Rocket propelled grenades (RPG) at the gates of Nelliaddy Central College and blast them so that Miller could drive the truck in easily. This was done as planned by Visu’s group. Unfortunately for Visu he was standing behind the woman cadre who fired the RPG and was hit by the backblast. This resulted in an eye getting injured. Visu then went across to Tamil Nadu and obtained treatment at the reputed Aravindhan eye clinic in Madurai.Despite this Visu lost sight in the eye and thereafter resorted to wearing tinted glasses. Now with news spreading about Visu being involved in the Amirthalingam assassination and about Visu being a renegade expelled by the LTTE, his brothers Muhunth and Murali got extremely annoyed with the tiger hierarchy. Both knew very well that their brother was a loyal tiger and had assassinated Amirthalingam only on the orders given by the LTTE leadership. So the brothers wrote to LTTE deputy leader Mahathaya demanding an explanation.The letter apparently was bristling with anger and written in strong language. The letter made Mahendrarajah alias Mahathaya relent. The LTTE could not issue an official statement but Tamil language news reports began to appear in early 1990 about LTTE meetings where tiger leaders began admitting to the Amirthalingam killing. Mahathaya himself started disclosing openly on public platforms that the LTTE had killed Amirthalingam and dubbed the TULF leader as a traitor. Even as these happenings occurred the LTTE observed its “Maaveerar Naal”or great heroes day for the first time on November 27th 1989 at a secret location in the Wanni. The meeting in which about 400 to 500 young cadres participated was addressed by LTTE supremo Veluppillai Prabhakaran.This speech was not a prepared text written by Anton Balasingham.Prabhakaran spoke from his heart reaching out to the young tigers paying rapt attention to their “Thalaiver”. During the course of his speech ,Prabhakaran said in Tamil that it was “Naangal”(we)who killed Amirthalingam.Explaining further he said that Amirthalingam had at one time espoused the Tamil Eelam cause but had later betrayed it . Anyone who betrays Tamil Eelam is a “Thurogi”(traitor)and has to be killed,Prabhakaran stated. He then went on to say “Naalaikku Prabhakaran Thamizh Eezha Latchiysthukku thurogam Seithaal, Neengal Ennai Suttuk Kollungal”(If Prabhakaran betrays the Tamil Eelam ideal tomorrow you all must shoot and kill me”)This speech by Prabhakaran was widely distributed abroad in a video. Meanwhile the Govt-LTTE talks continued in Colombo and at one stage deputy leader Mahathaya too joined the talks in Colombo with the govt. He was interviewed by “Lanka Guardian”editor Mervyn de Silva in Colombo.The interview was published in the LG of March 15th 1990. In the interview,Mahathaya was posed the question”If you stand for the multi-party system,why did your men kill Amirthalingam and other TULF leaders”?by Mervyn de Silva. Mahathaya replied thus –“They were not killed because they held views different from that of the LTTE but because they were acting as the agents of India,in short,traitors and collaborators.In that background,the LTTE kills those who betray the cause………………………in a national struggle,the battle is everywhere,the traitor anywhere”. 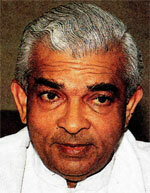 Armed with extracts from the “Lanka Guardian”interview with Mahathaya ,journalists in Colombo began questioning cabinet minister Ranjan Wijeratne at a media briefing held on March 22nd 1990.A nonplussed Ranjan did his best to cope with the journos.He said he could not comment as he went by the evidence.Despite Mahathaya’s admission ,minister Wijeratne maintained the fiction about Mariyathasan’s confession that the LTTE was not responsible. When asked whether he had asked Yogi about LTTE complicity in the murder as he had promised earlier, Ranjan claimed he had not met Yogi after that promise.When it was pointed out that Yogi had attended the all –party conference where the minister was also present, Ranjan quipped that he had told Yogi he wanted to meet him but the tiger leader had left before he could talk to him. Scribes however kept up the pressure and resumed questioning on similar lines at the press conference held on April 5th 2014.Ranjan Wijeratne reiterated “I do not go by press reports.I go by evidence.The evidence shows much more than meets the eye”.Responding to further questions, the minister said that if Mahathaya had in fact admitted to the killing in the interview to LG ,then he as state minister of defence would get the Criminal investigation department to interrogate the LTTE deputy leader about it.He kept repeating farcicially that Mariyathasan’s confession cleared the LTTE of involvement despite the tiger deputy leader proudly claiming responsibility. Neither Ranjan Wijeratne’s promise of discussing the matter with Yogi nor his assertion about getting the CID to question Mahathaya ever materialised. Though the fourth estate kept badgering the ex –planter on the issue it was implicitly understood that the Govt was never going to acknowledge that the LTTE had assassinated Amirthalingam while talks with the Govt were in progress. The situation soon transformed with the Indian army leaving our shores before March 1990 ended. War broke out between the Sri Lankan armed forces and LTTE in June 1990.Now the country saw a belligerent Ranjan Wijeratne breathing fire and brimstone at the tigers.”Next time no Hilton or Galadari treatment.Only Saraswathy cafe food for the LTTE”he quipped.The man who made a valiant effort to obscure the truth and absolve the LTTE of responsibility in the assassination of Amirthalingam was himself assassinated by the tigers via a car bomb on March 2nd 1991. The LTTE was quite mindful then of possible consequences of assassinating Amirthalingam.That is why they went through elaborate motions of inviting Amirthalingam and Sivasithamparam through Yogeswaran for discreet talks at Pandikulam in Vavuniya.Had the TULF hierarchy fallen for the trap and proceeded to Vavuniya they would simply have disappeared from the face of the earth. “What has happened to Amirthalingam”?would have been a perplexing question and conspiracy theorists would have had a field day.Though the LTTE would also be suspected there would have been no concrete evidence to link the tigers with the disappearance.This however could not happen because the TULF leaders refused to go North. Thus the tigers had to kill them in Colombo. In this respect there are a few details I left out inadvertently in my earlier article on the Amirthalingam assassination. I had written about Nissanka killing the tiger trio which is substantially correct.But what I failed to write about was that two other Police officers also had fired and wounded the killers though Nissanka had inflicted the fatal injuries. Sub –inspector Kandasamy shot and injured Aloysius while constable Lakshman fired and wounded both Aravintharam alias Visu and Sivakumar alias Arivu.Since both officers were Tamils details of their firing were kept out of newspapers then in a bid to protect their families from possible LTTE vengeance.Incidently Lakshman is now living in North America. Another clarification is about how Nissanka Thibbotumunuwa had a second gun with him.It was possession of a second weapon that helped Nissanka to overcome the tigers particularly Visu who had a grenade clenched in his fist when gunned down. This was because another colleague on security duty at the Amirthalingam residence was on leave that day. This man named Silva had entrusted his weapon to Nissanka. This was how Nissanka had two guns with him when the firing began.Both Nissanka and Silva were from Mahaweli security and were personally assigned by Gamini Dissanayake for Amirthalingam’s security as trustworthy officers. The truth about the Amirthalingam assassination could have been revealed more comprehensively if the Tamil United Liberation Front(TULF) had taken the initiative years ago when it occurred. The only surviving eye witness Murugesu Sivasithamparam maintained a deafening silence overtly on the matter.This was understandable in view of prevailing circumstances at that time.Sivasithamparam would however privately relate what happened to a select few. Siva Aiya as he is known told me what had exactly happened in a telephone conversation. It was a very graphic account replete with details.When I commended him for his memory Sivasithamparam replied”How can I ever forget what happened that day ,Thambi”?This was a few years after the incident.Siva however wanted an assurance that I refrain from publishing what he told me then. I have also spoken with Mrs. Mangaiyarkkarasi Amirthalingam and Mrs. Sarojini Yogeswaran about their recollection. Now 25 years after the incident I have been able to write vividly about the assassination and its aftermath in two successive columns for the “Daily Mirror”.